Sometimes you’ve tried every diet out there but you just can’t seem to lose the weight. Perhaps you feel hungry all the time and nothing is working to make you feel full. In many people, suppressing the appetite is an effective form of weight loss for one simple reason: you don’t feel hungry, so you don’t eat as much. Here at Houston Weight Loss Center, we can recommend and prescribe safe, effective medications as part of our supervised appetite suppressant programs. One such diet medication is Phentermine, also known as Adipex (brand name), a stimulant that can help obese patients lose weight. Phentermine assists in weight loss by suppressing appetite, with the added claim that it gives you a boost in energy for working out and burning fat. Oral phentermine hydrochloride, approved for short-term use in the treatment of weight loss, is a commonly prescribed appetite suppressant that can lead to faster weight loss when used alongside a healthy diet, exercise and behavior therapy. It can help reduce hunger pangs as you incorporate changes from your new lifestyle. Phentermine works by stimulating the hypothalamus gland and signaling neurotransmitters to reduce appetite on a short-term basis. We can help you safely incorporate drugs that reduce appetite in an effort to clinically treat obesity and promote weight loss. These prescribed appetite suppressant drugs have been successful in reducing hunger pangs and thoughts about food, making you feel satisfied after eating smaller portions than you normally would. You are likely to experience rapid weight loss while on this medication, provided you use it as part of a healthy overall lifestyle. Diet and exercise go hand in hand when it comes to making any weight loss solution work. Losing weight not only gives you a longer life span, it also makes you feel good about yourself, boosts your mood, gives you more energy, alleviates daily pain and vastly improves your quality of life. That being said, prescribed medications like oral phentermine hydrochloride are not to be taken lightly; they can have serious side effects when abused. That is why you should take this medication only under the supervision of a doctor. We have the solution. You should always consult with a doctor before taking phentermine or another diet suppressant. You doctor will go over your medical history and cross reference any of your existing prescription to ensure it’s OK to take phentermine. When you come to Houston Weight Loss Center to take part in our trusted appetite suppressant programs, we will conduct an examination to ensure this is the best option for you. 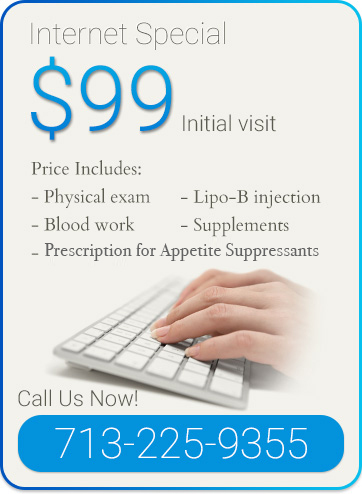 We only prescribe our appetite suppressant medicines after performing a complete evaluation by a medical doctor. Once the exam is complete, your doctor will inform you about how your prescribed appetite suppressant medication will fit into your customized weight loss program. It’s important that you recognize how to take this medication and how to use it responsibly for the best results possible. Enroll now in our Appetite Suppressant program, where you will be provided a prescription for appetite suppressants along with Lipo-B injections and supplement samples. For one low price (just $99! ), you can get started on your weight loss journey. Schedule a consultation online or call the Houston Weight Loss Center at 713-225-9355 to enlist in our fast and effective weight loss program.